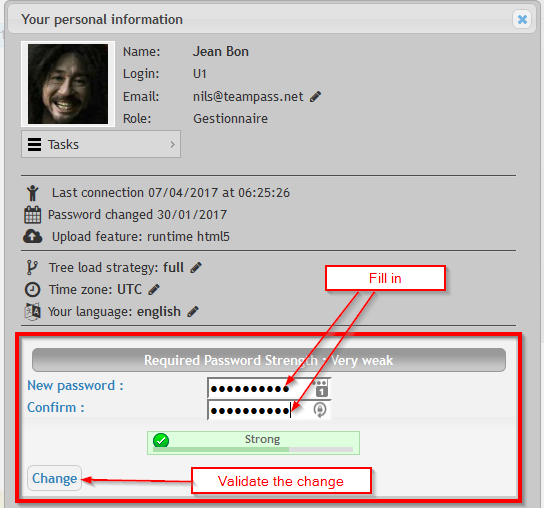 The User Profile dialog box is used to define a User's settings. Those settings are only applied on the User's account. The dialog box is as below. As a User, it is possible to edit and change the next parameters. Click the pen icon at the left of the current email address. Do as explained below. Decide if you want to load the folders Tree in Full or Sequential way. Full loads the complete folders Tree in one step (this is the default recommended setting). Sequential loads the folders Tree when user selects a folder (this is the recommended setting for large Trees). Select the Timezone corresponding to your localisation. Permits the User to define the language to use in Teampass. Note that you can participate to the translation of Teampass using Poeditor. Tasks are useful to perform specific actions. From Tasks menu, select Select profile image file option, and follow instruction. This will load the new image file (jpg or png files) as your Avatar. 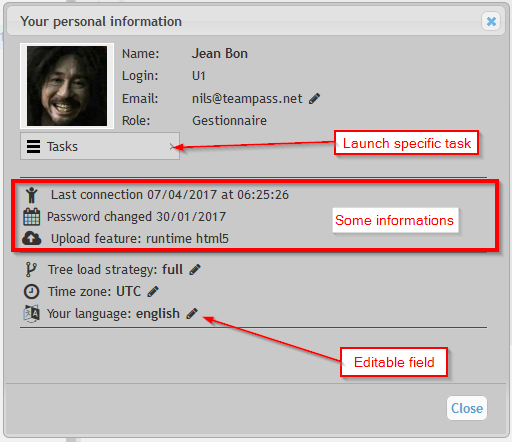 This task permits you to change the password you are using to get logged in Teampass. From Tasks menu, select Change password option, and follow instruction below. This task permits you to change your personal saltkey. Remember that the personal saltkey permits you to encrypt your personal items. This means that only this saltkey can encrypt them. No one else that you knows how to decrypt your personal items password. So keep it safe. 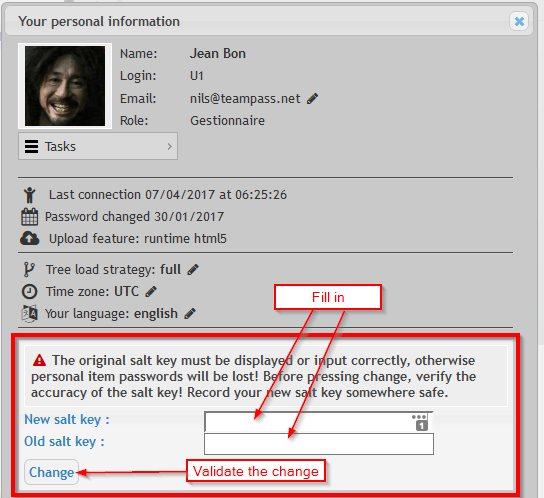 From Tasks menu, select Change my personal saltkey option, and follow instruction below. Note that those fields are not masked. When pressing the button Change, the encryption process of the existing personal items will start. Be patient until the message Done appears. The page will then be reloaded automatically. This task permits you to Reset your personal saltkey. It shall only be used if you have lost your current personal saltkey. 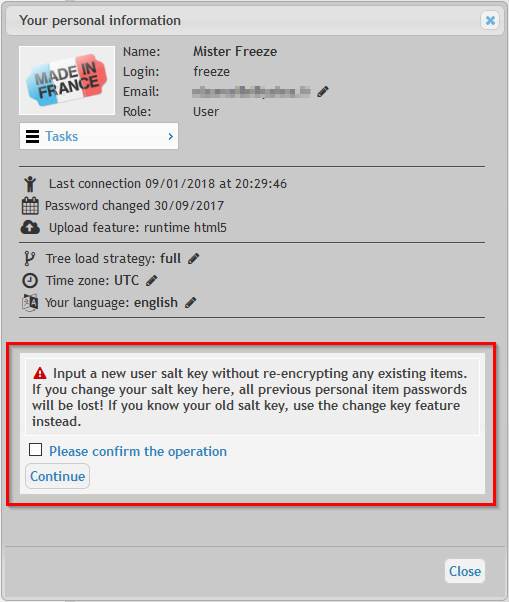 From Tasks menu, select Reset my Personal Saltkey option, and follow instruction below. BE CAREFUL, this task will delete your existing personal items as they are considered lost because you don't have the personal saltkey anymore.